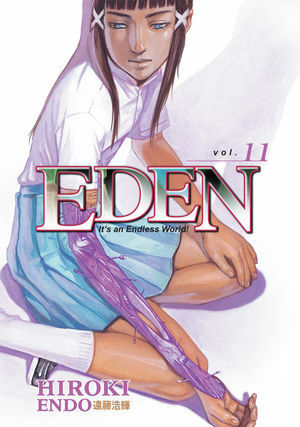 It seems like it’s been an awfully long time since Dark Horse released the tenth volume of Hiroki Endo’s Eden: It’s an Endless World! Since the book is dense with character and event, it would behoove me to undertake a quick refresher course before I dive into the eleventh. I’ve got no problem with that kind of homework, as Endo’s comics lend themselves to re-reading. Anyway, for those of you who’ve forgotten: a weird virus has decimated the human population, and after things settle down on the epidemic front, everyone starts scrambling for power. Now, the virus seems to be staging a rather nasty comeback. Should be fun! My refresher course might have to wait just a little bit, as Viz will be delivering two new comics from Naoki Urasawa of Monster fame. 20th Century Boys promises “a gang of boys who try to save the world.” Pluto: Urasawa x Tezuka is Urasawa’s re-examination of one of Osamu Tezuka’s most famous Astro Boy stories, “The Greatest Robot on Earth.” (If you’d like to read Tezuka’s original, Dark Horse can accommodate you.) I bought these at the bookstore over the weekend, because they were there and I have no impulse control. So far, Pluto is kind of like Law & Order: Criminal Intent, but with robots, which lands it right in my comfort zone, with the added bonus of no overacting by Vincent D’Onofrio but the loss of Kathryn Erbe’s enchanting way with caustic skepticism. People have said nice things about Mysterius: The Unfathomable (Wildstorm), written by Jeff Parker and illustrated by Tom Fowler. I liked Parker’s Agents of Atlas (Marvel) mini-series a lot, so I’ll possibly pick up the first two issues if there are any shelf copies at the shop. If not, I’ll just pick up the trade eventually. You are currently browsing the The Manga Curmudgeon blog archives for the day Tuesday, February 17th, 2009.